You can choose to analyse any report or dataset in Excel, although all that this really means is that you get a pivot table. This feature only works if you have Power BI Pro (the paid version of Power BI Desktop). 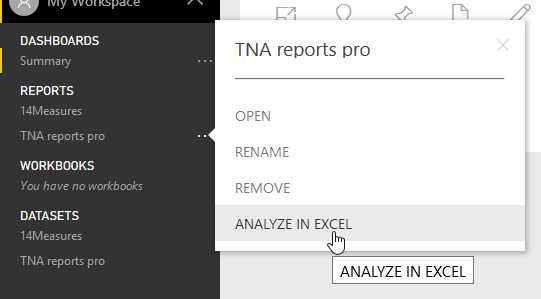 There are a lot of things which can go wrong when you try to analyse data in Excel (so much so that Microsoft have created a trouble-shooting page just for this feature). The end result is just a pivot table based on your data, so I'm not convinced it's worth the candle (a good English expression). Target audience For such a simple concept, there's a lot of theory involved. This blog will give an overview of the steps involved, but you'll need to understand how to use Power BI Desktop and Excel to understand these fully. Method used Some people may be lucky enough to get an Excel pivot table appearing directly on screen. I'm not one of those fortunate people, so the method shown below explains how to turn the connection string generated into a pivot table instead. Although I have a perfectly good numerical column in my dataset (NumberTests), I won't be able to report on it without incorporating it into a measure such as the one shown. You then need to publish the report so that your measure is included in the dataset in Power BI Service. if you haven't created a measure for, I'd suggest moving on to the next part of this Power BI Service blog! Choose to create a pivot table in Excel based on the dataset for a report. 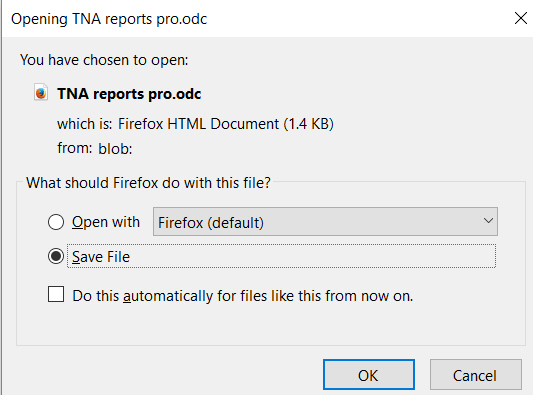 Save your connection string as an ODC file. The renamed connection string file. Choose to base your pivot table on a connection you'll choose. Click on this button to choose a connection, then double-click on the file you've just created. Choose what should go where in your pivot table. The TestCount measure is the only one we can aggregate. Phew. Was it worth it? Personally, I don't think so!